I got asked, what my favorite plant is. Well, asking a horticulturist to tell you what her favorite plant is, is rather like asking a mother to tell you who her favorite child is – it’s impossible. But when pressed, I breakdown and admit to liking one particular plant slightly more than all the others. Firecracker Penstemon (Penstemon eatonii) is my favorite plant. There is so much to love about this beautiful perennial; it is hard to know where to start…. reddish-orange flowers, it attracts hummingbirds, blooms winter through spring, is low-maintenance, drought tolerant and native to the desert. This particular penstemon species can be found growing in the Southwestern United States. Heat and cold don’t bother it. It can grow in 100+ temperatures and is hardy to -20 degrees F.
Beautiful orange/red flowers bloom in the winter and spring. Grown easily from seed, Firecracker Penstemon reaches a mature size of approximately 2′ x 2′ when in flower. 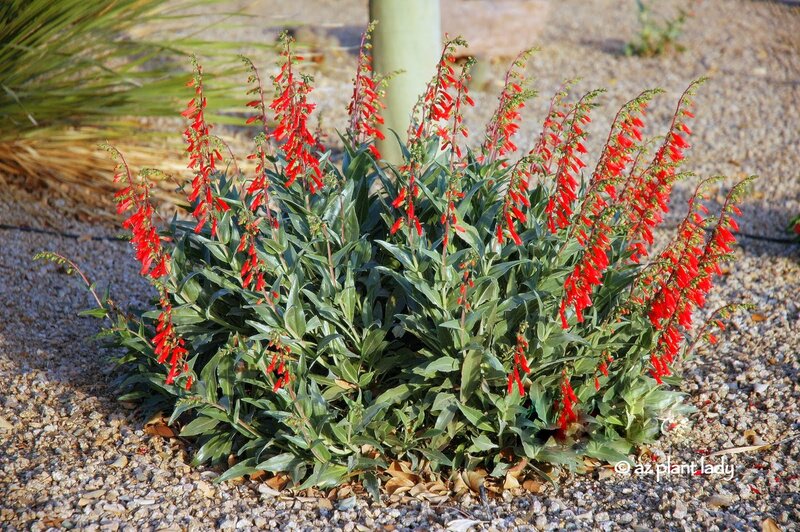 Firecracker penstemon is a welcome asset to the desert flower garden. Plant in full sun and keep away from the shade as they will grow leggy from lack of sunlight. I particularly like the way they look when planted singly next to boulders. They also look spectacular in bloom when planted in groups of three. Place alongside other plants that are either yellow or white which will contrast nicely with the orange/red color of this Penstemon’s blooms. Recommended companion plants include damianita, blackfoot daisy, prickly pear cactus, brittlebush, agave, angelita daisy, and desert marigold. For maximum hummingbird viewing, be sure to plant firecracker penstemon where you will be able to see the hummingbirds feeding. MAINTENANCE: This perennial is low-maintenance. The primary requirement is the removal of spent flower stalks, which will often promote additional flowering. Firecracker penstemon is drought tolerant when established, but will require regular irrigation to look their best. At the minimum, supplemental water will be needed in the summer months. Older plants can be-be cut back to remove old, woody growth. NO fertilizer is required. Now you know why firecracker penstemon is my favorite plant! I encourage you to try this beautiful plant in your zone 5 – 10 garden. I am sure you will love it as much as I do. Thanks for the info on this plant for hummingbirds. I am trying to draw more of them into my gardens. I need to look for some seeds of this plant now. Have a great weekend. Appropriately named flower, it really is an explosion of color! Glad to know you enjoyed my blog, especially the four eyed spider! Passing through your turf tomorrow on our way to vacation in Sedona! Thanks for visiting my blog. Your's is just beautiful, I love those penstemons! Hi What an interesting post I look forward to seeing more of your lovely blog. I have two contacts loosley in Arizona one my second cousin who was head of NIH in Phoenix now retired and the other a fellow Lyme sufferer who started the Arizona Lyme group, small world especially where blogging is concerned. I think I have something very similar to that tiny beautiful flowers. I'll try to post the picture when I can. The plant (leaves) is different, though! I will definitely try this one next year. I'm always looking for new plant varieties that the birds, hummingbirds and bees like! Penstemons! I love them and that one is a cracker. I wonder if it would survive in waterlogged Argyll? I used to have a bed of penstemons mixed with verbascum and annuals like cosmos and cornflowers. They were always buzzing with insects but that was central Scotland and a drier, colder climate. Mmmm firecracker plans for next Spring. I'm sold. I want to try it in my garden. It's fun to see what grows in other regions. Here in zone 5b we're getting ready for the long winter rest. The last of pic approaching the flower is just amazing. Firecracker plant is common in our climate as well. and yes it is adorable due to the attributed you just described. Thanks for this informative post. It is always pleasure seeing those plants which are suitable to my climate. Beautiful plant! and such a Wonderful informative post! I think it'd be the perfect fire-y energy kind of plant for a Leo like me!Great color too. Hi Noelle, thank you for your comment. Your posts are beautiful, and you give great information on plants liking a dry area. The fire cracker plant is gorgeous, before I read its name I thought it was a red Salvia, which do not mind to grow in a dry place. I grow plants in a complicated climate, because it can be very dry but also at certain times very wet. At the moment it s very dry, since three month no rain. Last year at the same time we had quite a lot of rain. Australia has an great array of plants which like dry soil. Hardenbergia is a lovely, little climber. I like growing different kinds of penstemons. I'm guessing this one doesn't grow here in zone 5b Nebraska. It sure is a great looking one! This has been on my list of possible plants to try. I think I will move it to the top – I really like the way it looks in your garden, and I like that it attracts hummingbirds. For some reason in tucson my firecracker penstemon is perennial (six years and counting) whereas my Perrys penstemons die out each summer and grow elsewhere the next season. Someone (a bird?) just snapped my main stem at base so hoping the surviving plant will grow back. My firecracker penstemon is over 15 years old. I do find the parry's penstemon rarely lives more than a year, so I treat it as an annual. Yours should grow back. Ready, Set, Go! Time to Start Planting! Why Do Cactus Have Spines ?